The disc is certainly the least practical aspect of my work, which must mean that it is the most important, otherwise why would I go through such heartache? I have always been a process-based artist, even when I was working in figures, abstraction, and conceptual art. My work has always hinged upon a technical pursuit. This problem has become the mother-of-all, keeping me continuously challenged, and rewarded, for more than a year with no end in sight. Current explorations are expanding the possibilities of how this concept can carry over into the appendages and forms in a more significant and conspicuous way. Here’s the story of how the disc came to be. The work that I would consider the grandparent of my current work was built from thrown ribbons, cut apart, altered, bevelled, and then assembled. Once the frame was constructed, a slab was cut and hung from a ridge that was thrown in the original forum. Approaching my MFA Oral Review, it became pretty clear that this method of working was yielding a very small range of work, and presented a number of major challenges, to the point that peers of mine even called it self-sabotage. I decided that I must pick the most aspects of this body that was the most important, and simplify everything else. The seams and the slab were the aspects that I chose. Through a series of steps made toward the necessity of survivability, this body slowly developed. 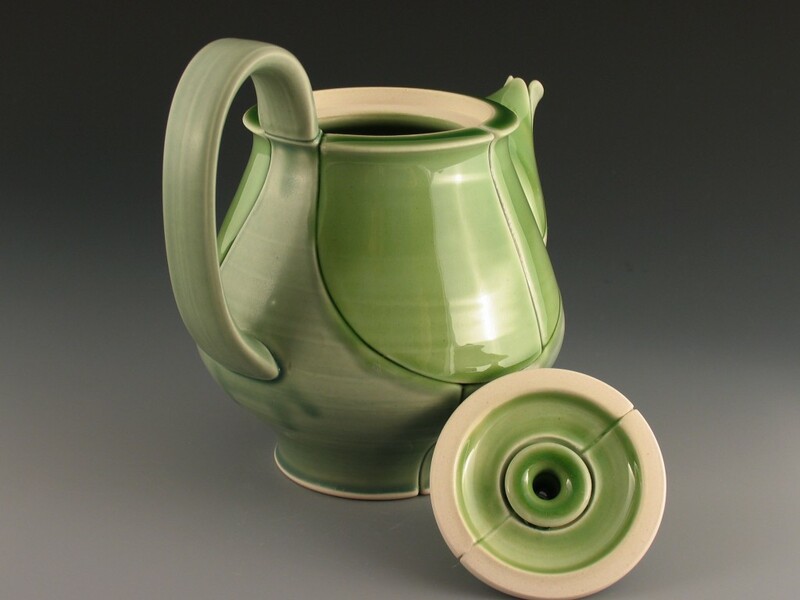 Seams developed in their own right, not to serve a function of joining two parts together that otherwise wouldn’t be, but as a decorative element, a way of drawing lines and patterns on the pot. The slab became the disc. I realized that measuring and cutting slabs was sloppy and inaccurate. Throwing was clearly the best method, which dictated that my pots go to a round footprint as opposed to square, pentagonal, and triangular footprints I was working with. After some trial and error, I learned that measuring the diameters was not working, so I decided to play the numbers game. I throw many discs of varied diameters, and store them, trimmed and signed, until needed in plastic totes lined with damp plaster. 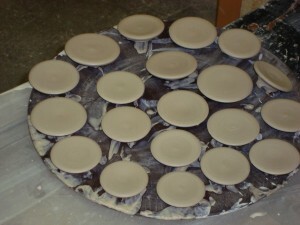 The pots are all thrown without a bottom. Instead, there is a hole with a ledge about 3/4 of an inch thick. 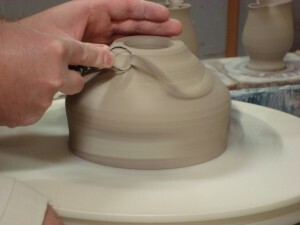 the pot is dried for a couple of days, then trimmed on the wheel. The last step of trimming is to trim the groove. I do this with a modified Kemper trimming tool. I simply bent the end with a pair of pliers, nothing too complicated. The groove is by far the trickiest part of the trimming process. 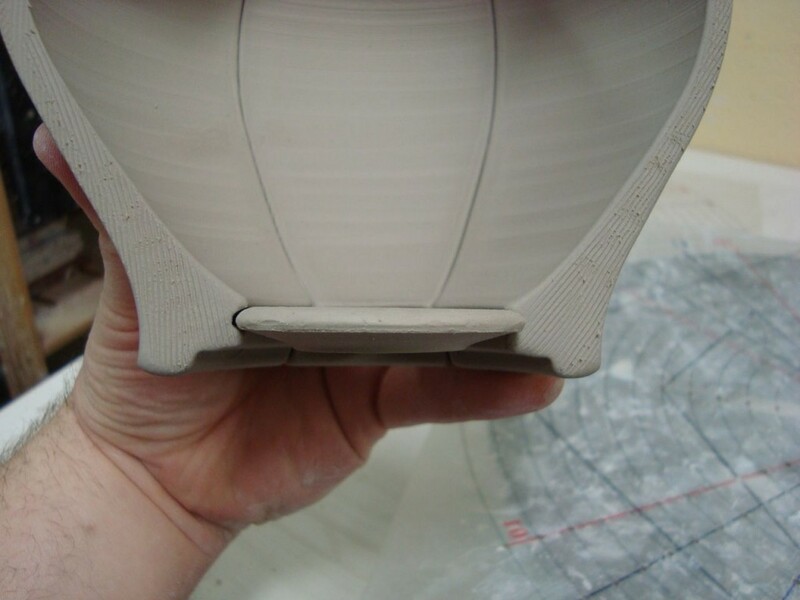 the ledge must be the perfect thickness, and the clay must not be too wet. 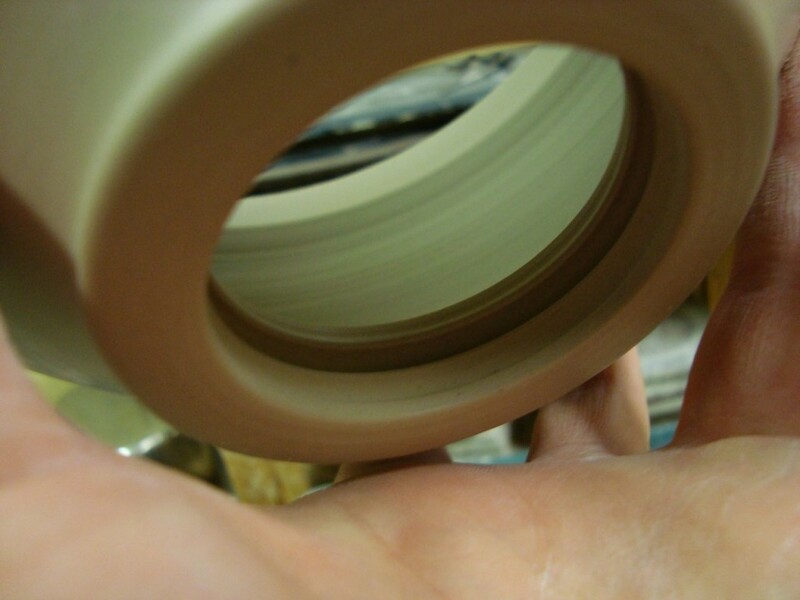 The groove, if done right, is very smooth and has some slight natural rolls of clay on both sides. 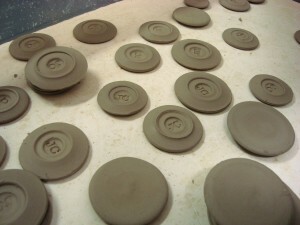 This will help prevent glaze from running through the pot during firing, and also looks really nice. If you are familiar with my building process, you know that everything is cut apart and put back together just how it was before it was cut. During the final step of assembly, right before the pot is put back together, I pick through all of the discs in my stockpile and find the one that fits perfectly. I want just a little bit of play in the groove, and want the disc edge to match the contour of the groove. After a test fit, the pot is carefully put back together in it’s final form. When this happens, It is very important the the disc is free floating. It must have a little bit of room to move, and cannot be slipped into place. Contrary to popular belief, I did not choose to do it this way just to torture myself. A lot of pots were lost before I figured this out. I kept getting cracks that would appear to be a continuation of the seam, right through the disc. 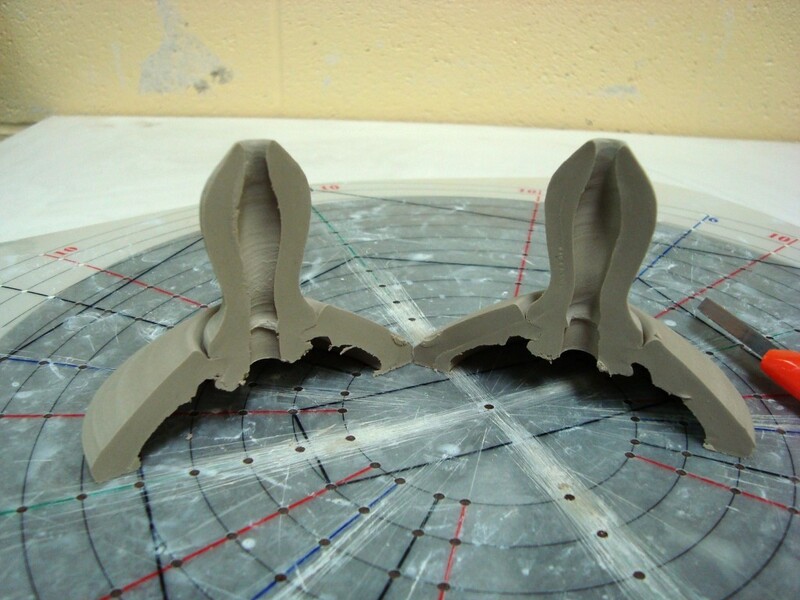 After a little bit of analysis, I determined that there must be some sort of discrepancy in the shrinkage of the two parts, which would make sense, as they couldn’t possibly be exactly the same dryness, not to mention the effect that particle orientations has on the shrinkage of the clay in the two parts. To solve this, I borrowed a practice from woodworking, particularly in frame and panel construction of cabinet doors. The frame is built, and the panel that sits within it is allowed to freely float, which allows for differences in expansion and contraction due to humidity changes. Not only does this help the pot survive the drying, but also the firing. The pot does not actually hold water until the disc is surrounded by glass, frozen in place. To me, the disc idea and the concept of dissecting as drawing go together hand-in-hand. 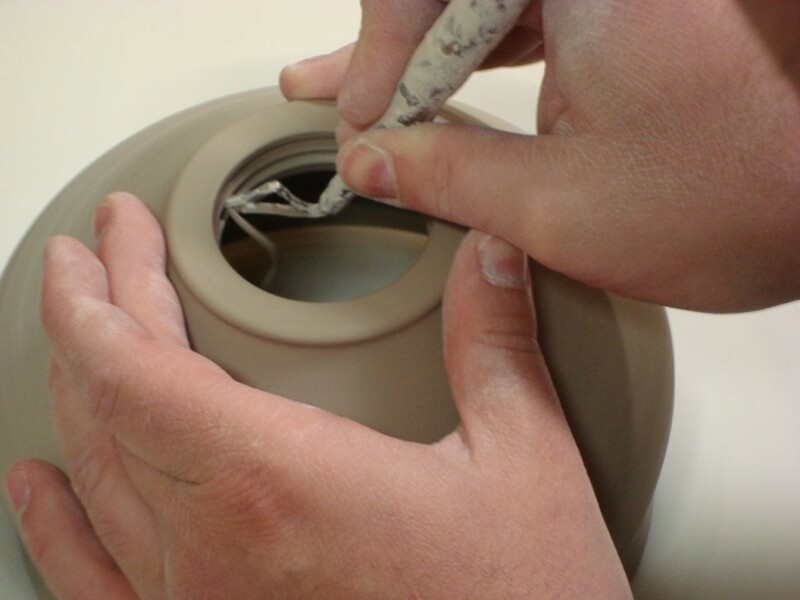 The pot is not finished until the disc has been placed, and the disc can never be placed without the disassembly. My exploration is tethered to these two limitations. Artistic limitations are not a bad thing. They are something to push against. A problem to solve that steers the work. 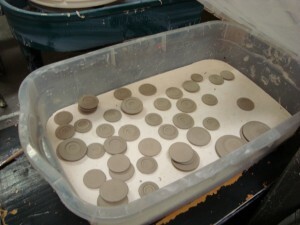 When the possibilities are endless, as they are in ceramics, you need something to form and develop your work around. I am reminded of an episode of Dirty Jobs Where they were making coral reef balls. Coral reefs want to form and can do so, but only if there is a small structure to start the growth. My use of disc and cutting, while presenting huge problems in terms of production, are the core of my work, that little structure that everything else forms around. 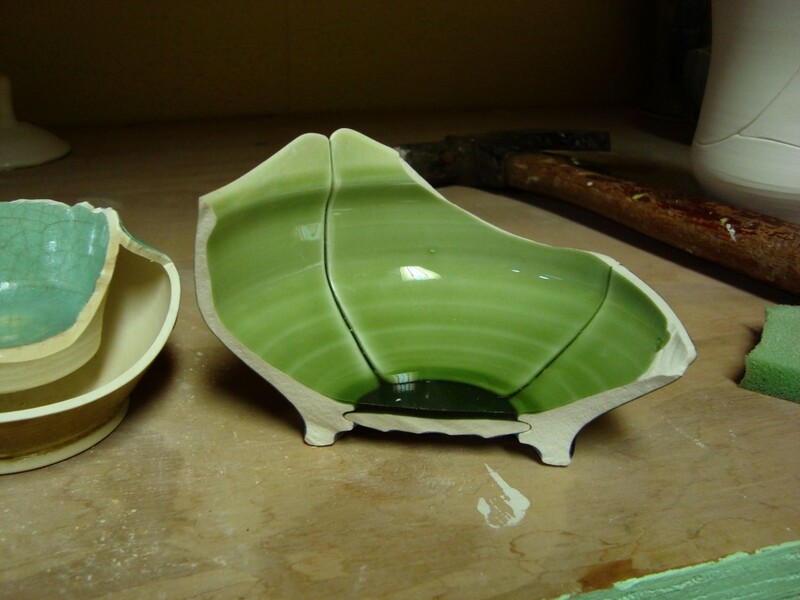 Glazes are developed to show off the seams, forms are simplified to emphasize line, etc. While solving various problems, like what a lid or a spout should look like, I try to figure out how these limitations can actually become something remarkable. During the making of my MFA thesis show, I wanted a way to show off the disc aspect without leaving pots flipped over or putting them on mirrors or something. After much contemplation, the idea for the disc lid was born. 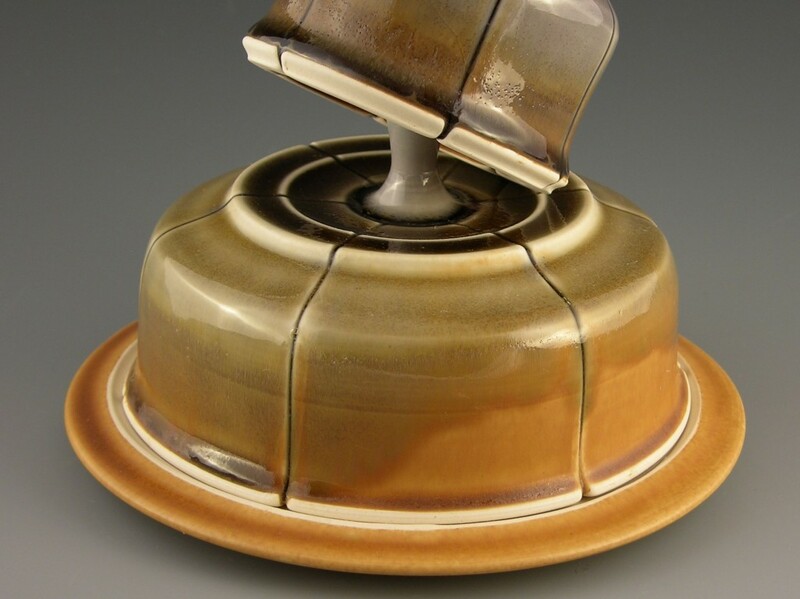 The Butter Dish that I developed for this show was made partly to round out the selection of objects, but also to show off the building method that is not apparent when objects are not able to be handled, as was the case. 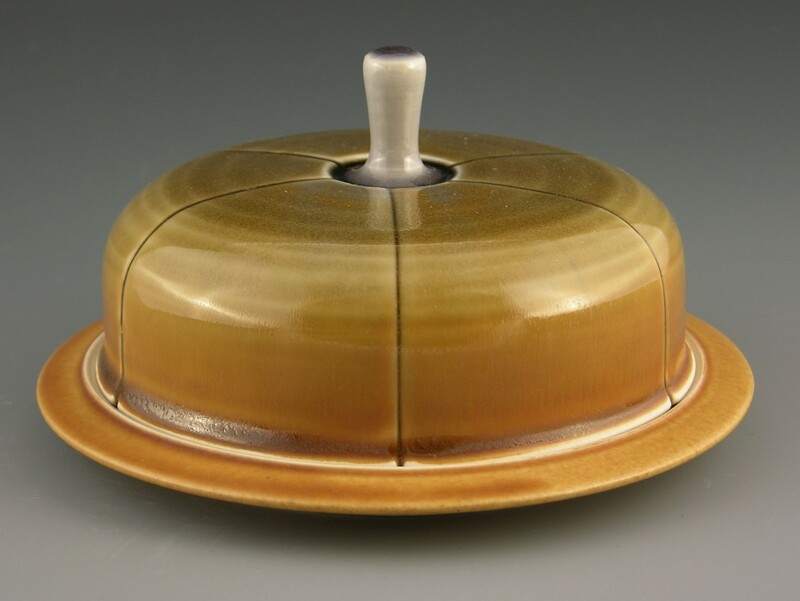 The lid’s knob is a separately thrown disc with a knob on it, and the form is reconstructed around it. Another disc alteration came about on the same pedestal. 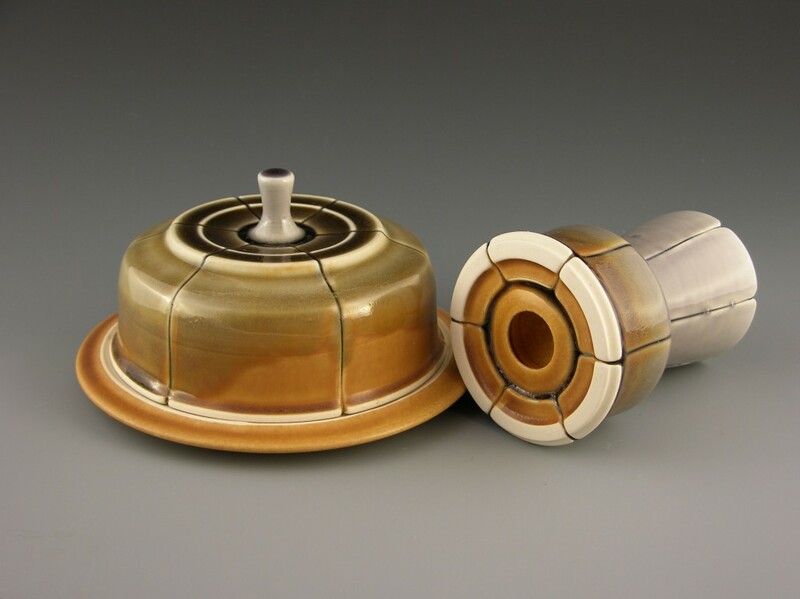 A set combining the butter dish and a vase, based on the last two objects cleared from the table, the two that can stay for days at a time, involved not only the altered disc of the lid knob, but a disc designed to allow the knob space when stacking. 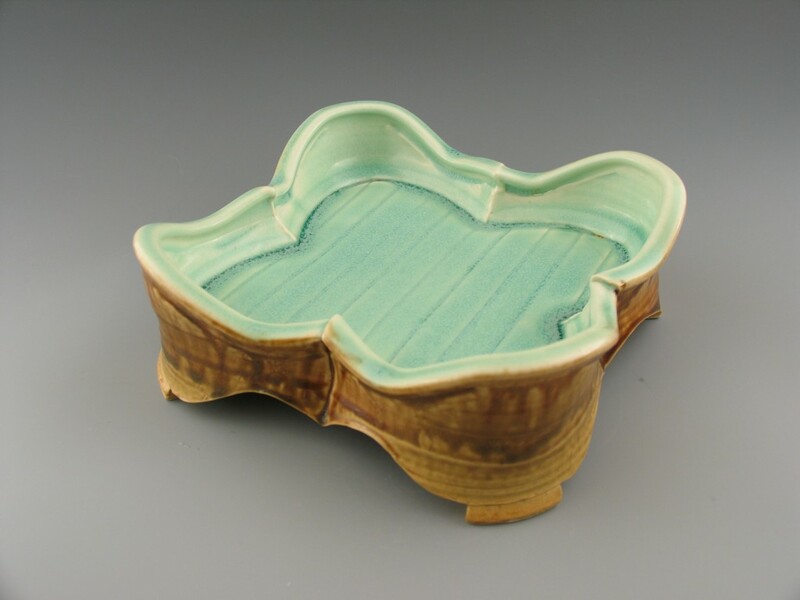 In this case, the lid becomes an upside-down, little pot set inside the larger pot. 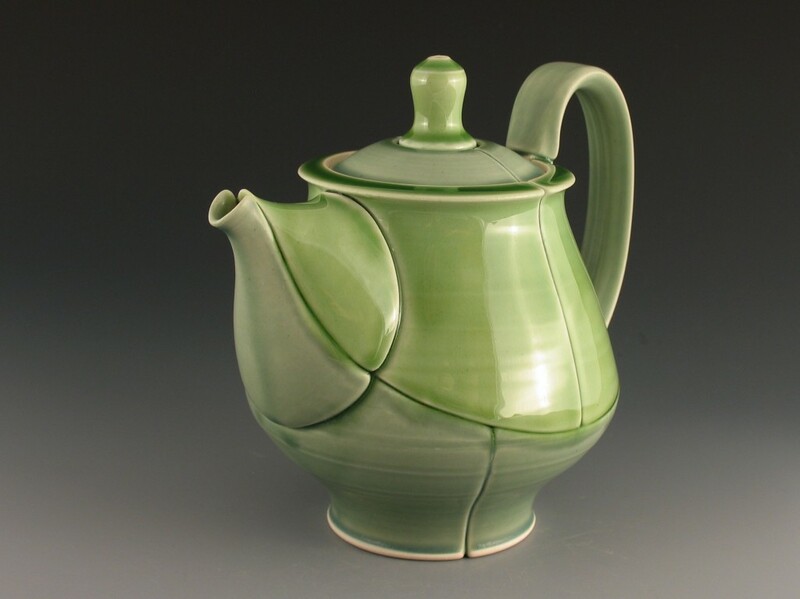 In the lids to my teapots, air must escape through the top to allow the pressure to remain constant, facilitating a smooth, steady, non-gurgling pour. In this case, I set the groove into the disc. The disc has a hollow shaft going through it, an elegant solution to the problem. 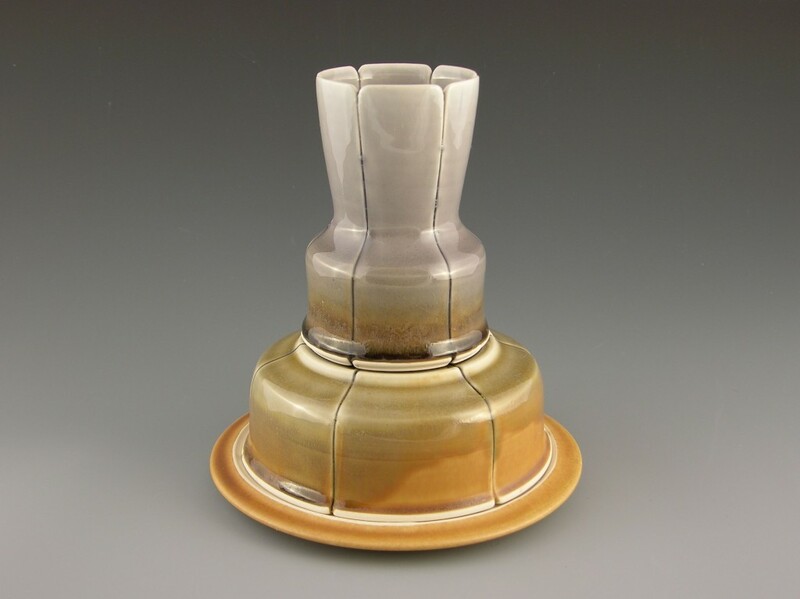 My newest exploration in the expanding the disc’s role in my work, the Flowerhead Vase, uses the disc as the middle point of the pot. These solutions are found as a result of refusing to give up the central core of my aesthetic, but instead, finding the solutions that are within the limitations. Ultimately, the limitations feed my inventive bent, and give birth to some pretty unique ideas. Thanks for reading, if you enjoyed this, please share with your friends, and also, please leave your questions and or comments. It is just mind blowing! The skill, the patience, the determination… thanks for a peek into the development of your artistry! Jeff, thank you so much for sharing this!! People often don’t understand the process we go through to achieve the end result. This multi level, multi year process of testing, planning, working is what makes you such an excellent potter. Your willingness to share this process makes you an awesome human being- humble and brilliant! Great blog! 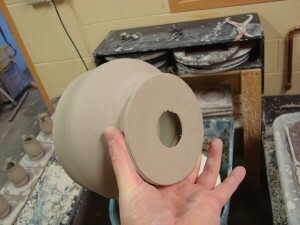 When you bisque your work does the disc slide around? I really like how you detail your thought process and work evolution. Yeah, Heidi. You can actually spin the disc around once it is bisqued. Right before glazing I center it, press up with my finger on it while filling it with glaze. hi jeff, fantastic post and beautifully written. i have to agree with one of your central points which is that creativity seems to flourish more when limitations are imposed on it regardless of whether the limitations are facts (like gravity) or conjured up by the individual. I have always imposed artificial boundaries and find that much of the creative juice flows from trying to navigate them as opposed to always having totally open options of being able to do anything that could possibly be done. great work and great explanations. Great article! Completely facinating… I figured the entire process was something as crazy as that, but that’s nuts! Love it! Beautifully written article. It is great that you stuck to what you wanted to acheive and now have mastered it.